Jockey Frankie Dettori’s post-race actions following his win aboard Raven’s Pass in the Breeders’ Cup Classic (G1) on Saturday are under review by track stewards working the Oak Tree at Santa Anita Park meeting, who could fine or suspend the European rider for throwing his whip in celebration. 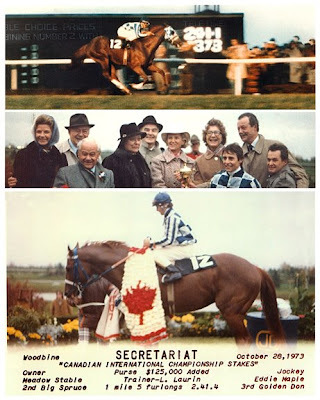 Secretariat’s final race, the October 28, 1973 Canadian International represents the final installment of our 35th Anniversary Racing Series. The $125,000 added 1 5/8 mile grass race from Woodbine racecourse was the last opportunity to display Secretariat’s talents before his retirement deadline as specified by his syndication agreement. The race served as a homecoming of sorts for the two Canadian-born members of the Meadow Stable team, trainer Lucien Laurin and jockey Ron Turcotte. 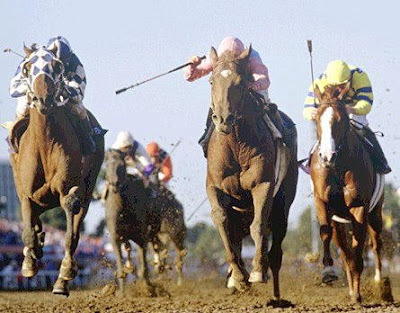 Alysheba, the oldest living Kentucky Derby (G1) winner, is returning to the United States to live at the Kentucky Horse Park in Lexington. Racing Hall of Fame jockey Chris McCarron, who piloted the Alydar horse to his greatest triumphs, made the announcement late Wednesday night at the annual National Turf Writers Association Awards Dinner at historic Castle Green in Pasadena, California. 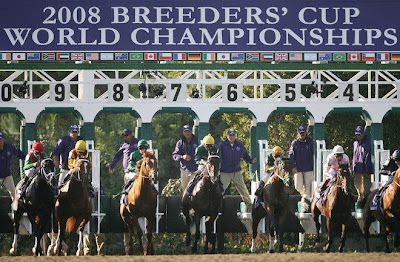 The horses break from the gate to start the Breeders’ Cup Classic at Santa Anita Park October 25, 2008 in Arcadia, California. 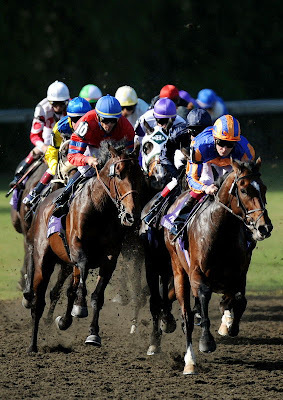 Frankie Dettori atop Raven’s Pass (3rd from the left) won the Classic. 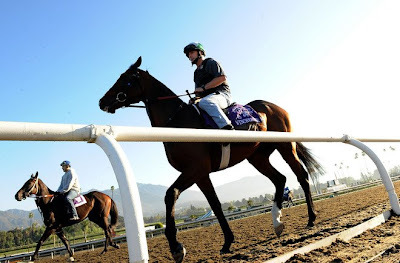 Jockey Colm O’Donoghue rides Red Rock Canyon ahead of Garrett Gomez atop Out of Control around the turn in the Emirates Airlines Breeders’ Cup Turf race during the Breeders’ Cup World Championships at Santa Anita Park October 25, 2008 in Arcadia, California. 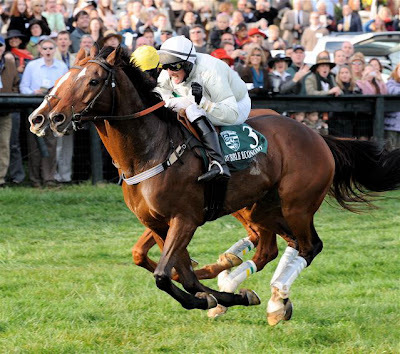 Sonny Via’s Good Night Shirt, ridden by Willie Dowling and trained by Jack Fisher, takes the final jump in the $250,000 Grand National Steeplechase at Far Hills, N.J. on Saturday. 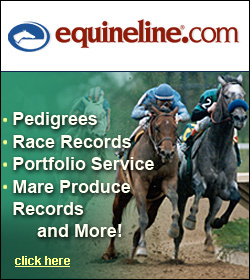 The win was the fifth straight Grade 1 for the reigning Eclipse Award champion. Be Certain was second, four lengths back, and Best Attack was third. 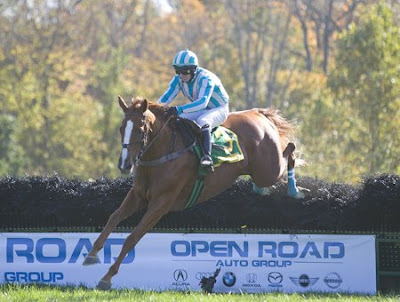 Gordie Key’s Virginia-bred I’m A Hokie won the $20,000 Old Dominion Championship series finale Saturday at the International Gold Cup Races at Great Meadow near The Plains. 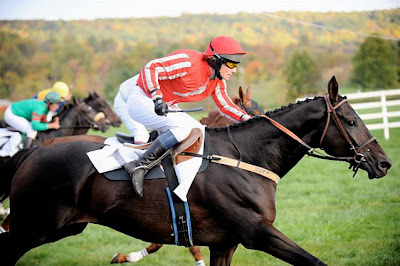 The aptly named Bubble Economy won the $50,000 International Gold Cup, October 18th at Great Meadow.